I believe in being the change I want to see in the world. Whether that’s through small, random acts of kindness, being involved in my community, or simply developing positive connections with those around me. Every little bit helps. In light of the physical and emotional disruption caused by Irma, I want to give back the best way I can. 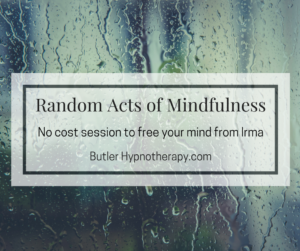 I’m offering free 30 minute sessions to shift post-Irma stress and anxiety, moving you towards a state of inner comfort. There is no catch, but this is a limited offer. Appointments are scheduled on a first come first served basis. To schedule you must email me at butlerhypnotherapy@gmail.com. Please note that I cannot accommodate walk-ins, you must have an appointment. Offer available for in-person sessions at studio b mind body hair only.